Soon, Jade must face an impossible fact: that her perfect house is haunted. Haunted by a ghost who’s seeking not just vengeance, but the truth. The ghost of a girl who ruled Jade’s school — until her untimely death last year. It’s up to Jade to put the pieces together before her own life is at stake. As Jade investigates the mystery, she discovers that her new friends in town have more than a few deep, dark secrets. But is one of them a murderer? The Dead and Buried is a story about Jade, the new kid in town. Her and her family just moved into this gorgeous old house and Jade is about to start a brand new school. As she begins her school year, rumors fly and soon Jade finds out that there is more to her house that meets the eye. There was a girl murdered there and now her little brother is seeing her. You all know I’m a huge fan of Kim’s writing. I adored everything in Clarity and Perception. The characters, the supernatural, and definitely the romance. Well, The Dead and Buried is another win for me. Jade is a great character. She’s a timid girl with a big heart. She loves her brother to pieces and will do anything to protect him. The ghost girl wants answers and to get them she’ll stop at nothing, even using Jade’s little brother. Now it’s up to Jade to find out the truth the detectives couldn’t. I loved seeing Jade grow throughout the book and take the necessary risks to protect her family. But she doesn’t do so alone. Enter Donovan. The broody-mc-broodster. I really liked him as a character. It was a nice contrast between Donovan and Jade and I felt like they really felt together well. He would not be my first choice for her and that is exactly why I loved them together. I have to mention Alexa, Jade’s antisocial friend. She was just such a fun addition to the rest of the story, I loved it. Alexa is this darker side of Jade, someone who doesn’t talk to people, who stays in her own little world, yet for Jade she comes to the party. I don’t know, it’s just little things that I love, I guess. Overall, I thoroughly enjoyed this book! I can’t dive into the mystery of the dead girl too much because I’ll give things away, but let me tell you, Kim did well on that. The supernatural and the mystery were excellently balanced in my mind, allowing the story to unfold perfectly. Sure, I knew who done it before the end of the book, but just getting there was a great journey. I have to add one thing tho, I really enjoyed how Kim wrote the whole haunting aspect. When you read it, you’ll see what I mean, but seriously, kuddos on that! In my opinion, Kim has done it again. Mystery coupled with supernatural and romance make for one great book. 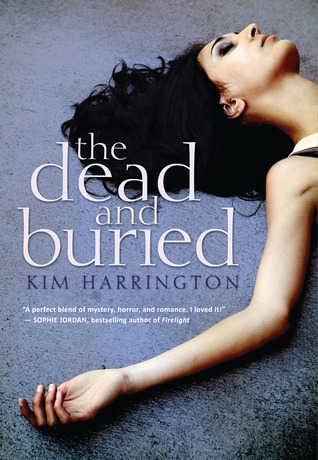 The Dead and Buried hits shelves January 1st, 2013! Get it, read it, love it! Let me know what you think!